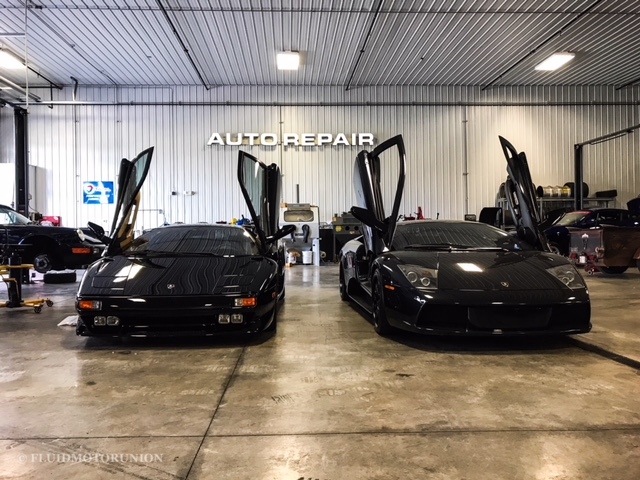 This project came to our shop in Naperville from a client who has an extraordinary passion for the ‘Italian Bull’ but wasn’t exactly hearing that passion out of his stock Murciélago. 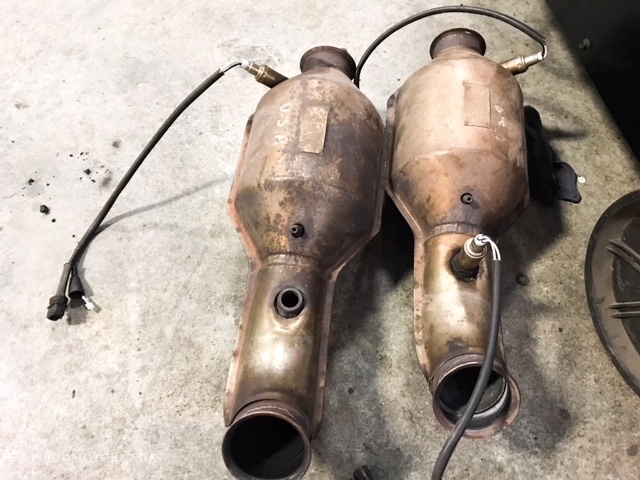 While the customer had the plan of just removing the secondary catalytic converters and replacing the cat’s with high flow units, we had different ideas. Removing both the primary and secondary cat’s from the system and streamlining with simple pipes wouldn’t be enough to bring out the “F1 shrill” that this V12 bull is capable of making. By replacing the cats with our FluidMotorunion proprietary megaphones, and combining the two cylinder banks with our smooth merge X-Pipe fitting we are able to coax the desired tone out of the beast.. Merging both banks = Twice as much ruckus! 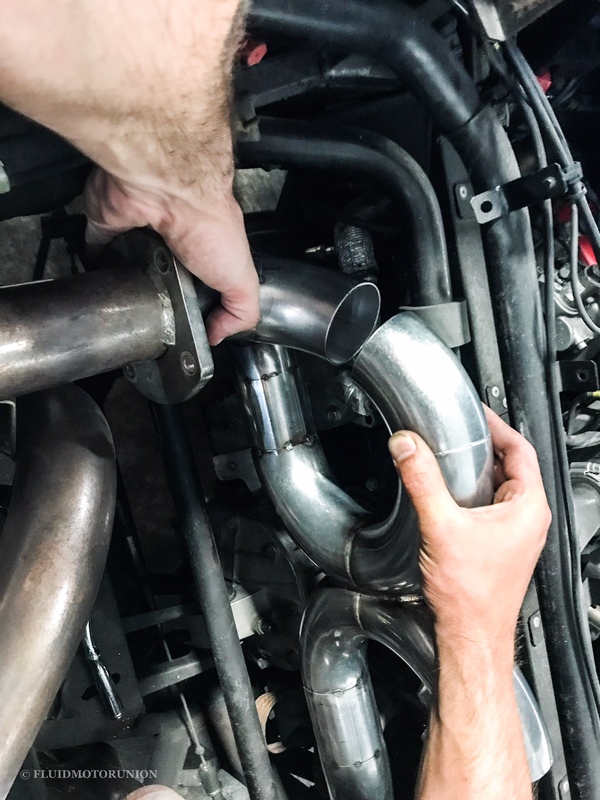 In the first stage of our system, the exhaust wave leaves the cylinders and reaches the megaphone style test pipes. Our Fluid Motorunion design amplifies that exotic high note and gives it a clean, unique tone that really sets it apart from the rest. 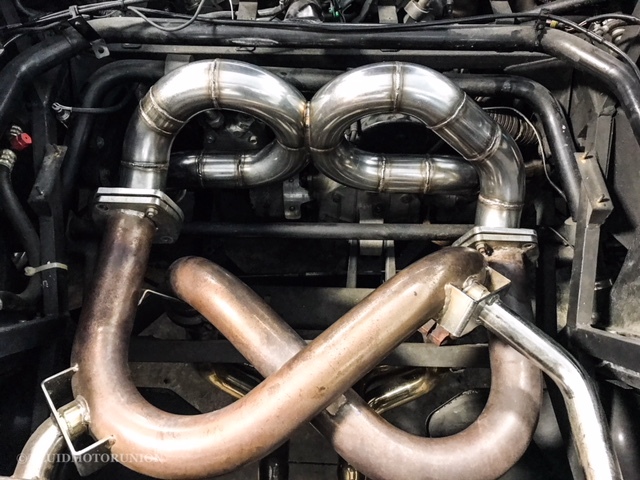 Once it travels to our custom fabricated Fluid Motorunion smooth merge X-Pipe, both sound waves conjoin from the two cylinder banks, making for a very unique and one of a kind (so far) sound that turned this once tame bull into a much more intense beast. 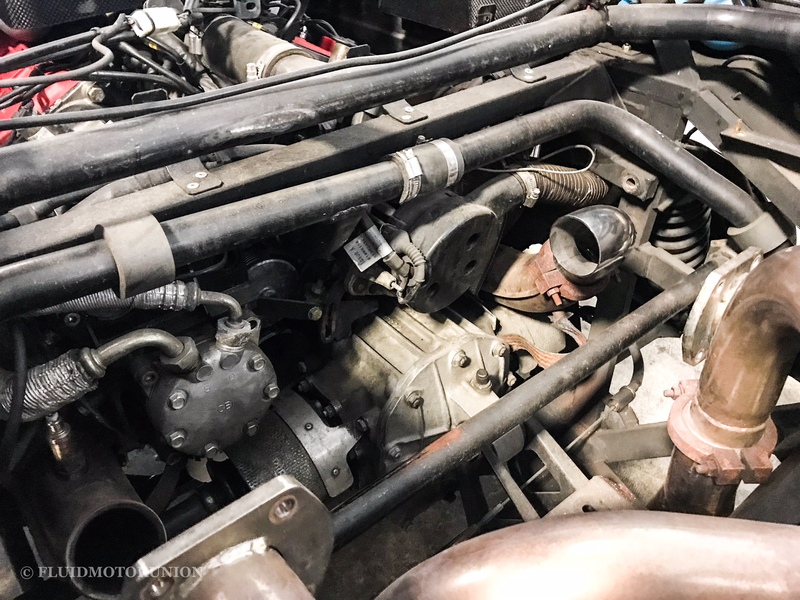 Even though the Lamborghini V12 has plenty of room behind the cockpit, removing the factory catalytic converters isn’t as easy as some may think. 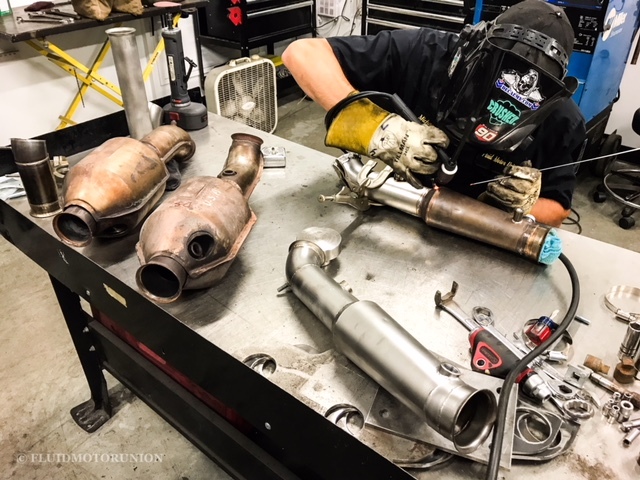 Pulling the cats requires the big motor to be raised up to make space to access the catalytic converter flange bolts that attach to the exhaust manifolds. We had to unbolt the motor mounts to lift up on the motor so we could get some wiggle room to remove the cats. This was complicated by the fact the clamps were rusted and the nuts then seize on the studs. Even with using the old “flame wrench” the stud still snapped, which made getting the clamp loose enough to access the last bolt a huge task. 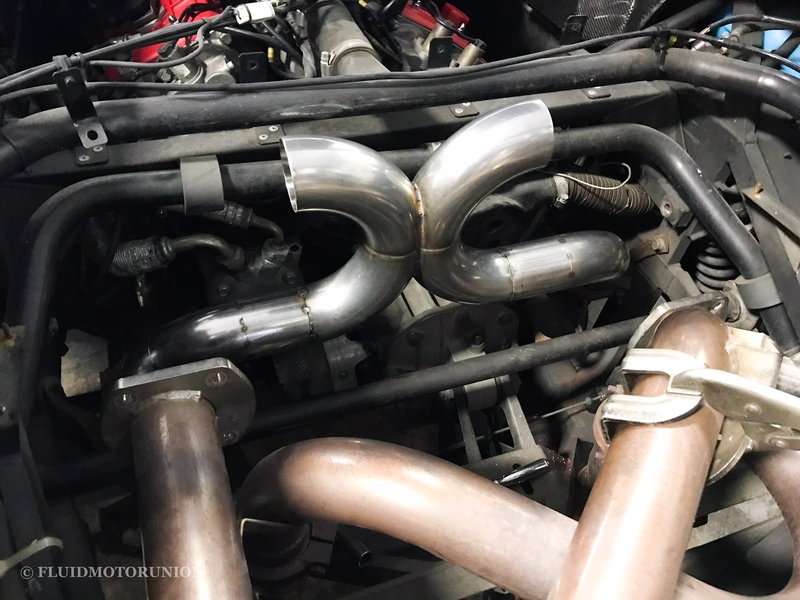 For this specific project, there are no valves keeping this quiet, we are dealing with a “race only” full straight pipe system! Time will tell if the client will be able to handle the loud roar of unfiltered 12 cylinders. 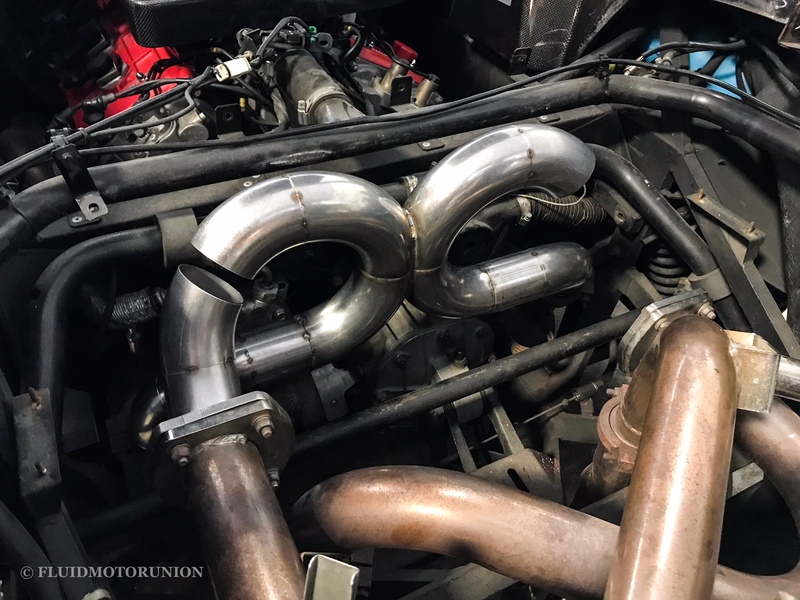 Want straight pipes for your vehicle? Come visit us at our Naperville Iron Gate Location and bring by the potential patient. With our design team, we’ll have ideas flowing as soon as we lay eyes on it.